Sturdy City of Life® Cotton Tote Bag with handles, and colorful, iconic City of Life® figures and logo. Show your support! City of Life® is a registered trademark. 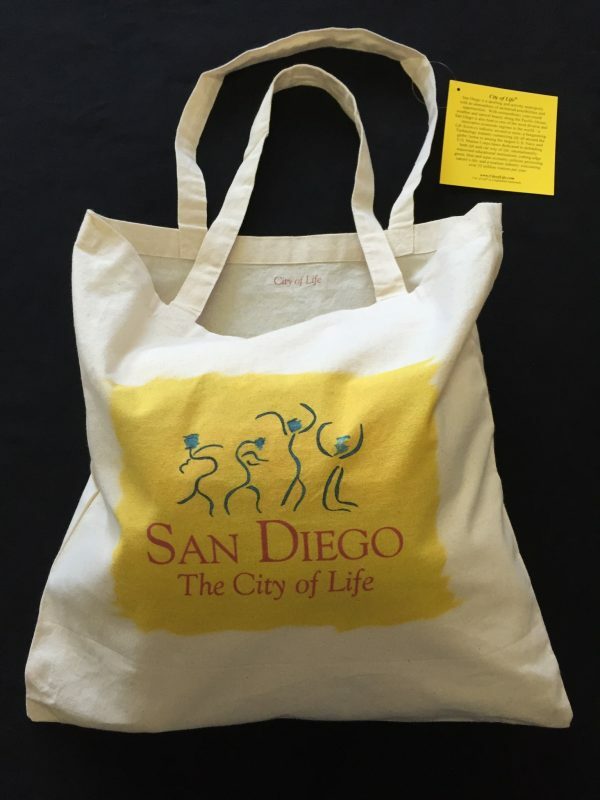 City of Life is a community-inspired effort to embrace a global brand and message for San Diego. New York City is globally recognized as The Big Apple + I ♥ NY, Las Vegas as Sin City + What Happens Here Stays Here, and Paris as City of Light. As one of the world's most compelling all-around cities, why doesn't San Diego have a comparable world-class brand and message? With your help, we intend to change this with City of Life. "In San Diego, we live LIFE bigger and better than anywhere else in the world. The reasons are three-fold: First, we are blessed with the best year-round weather in the world, bar none. Second, we are situated in one of the most unique, diverse, and extraordinary geographic locations in the world...70 miles of breathtaking beaches along the Pacific Ocean, vast bays and harbors, mountains, valleys, rivers, deserts, neighboring Mexico, and on and on. Third, and most important, is the mindset of our people...a mindset that directly evolved from our weather and geography. Simply put, San Diegans embrace LIFE as having unlimited possibilities and opportunities...where we can quite literally do anything, anytime of the year. CITY OF LIFE perfectly defines who and what we are." Copyright © 2019 City of Life. All rights reserved. City of Life® is a registered trademark.